Ever since I started teaching, I always bring a huge bag anytime, anywhere. It's safe to have a big bag because all my essentials can fit it in. I can toss just about anything inside my bag without thinking much if it will fit or not. It wasn't in the photo because I used it for taking the photo above. It's my call, text and net surfing companion. Cellphone is also a necessity for me because it's also what I use whenever I want to take photos on things to blog. I just can't stand not having wet and dry wipes/tissue. It's my all around cleaning companion. For cleaning my desk, my hands, my bags, my shoes, everything! I always need to have this every time. What's the use of all my beauty products from sponsors if I won't use my kikay essentials right? Haha. I wear makeup everyday in class because I don't wanna look dull and tired. Despite being tired, I always need to look fresh in front of my students so that I'll get their attention. Weather nowadays is really unpredictable so bringing an umbrella is a MUST for me. I commute daily and I need to be always prepared. Since I am teaching, I always need a tumbler for my water because I talk non-stop. I always drink several times in an hour. Thanks to my Lock and Lock, bringing tumbler in class is a breeze. It's a newly launched tumbler that's safe to use. It's non-toxic and odorless. It's compact and light and fits even in my small bag. It also keeps my drink warm or cold for so many hours. My tumbler before was a huge mess. It spills even when it's tightly closed and the warmness or coolness disappears after few minutes. This is th esolution if you have the same problem as mine. #LockedInLove. By the way, if you want to avail the newly launched Lock and Lock Mini Mug Tumbler, you can avail this at the Lock & Lock Boutique Stores below and in leading department stores nationwide. You can also like Lock & Lock Facebook page (fb.com/LocknLockPhilippines). These are my basic teaching essentials everyday. You? I'm interested to know what's inside your bag. If you happen to have a post on your daily essentials, tag me. Would love to know what you got as well. Tag me! It's the same when you become a mom, a small bag won't do anymore. Lol. I carry pretty much the same things! I think when my time comes, it will be bigger than this. Haha. I didn't you're a teacher! So that explains the packet of tea bags. I thought you just randomly take it out and ask for a hot water from the waiter, hehe! I really don't get what the tea means. I've been a tea lover ever since. Thanks! I'm actually contemplating if I need to change the layout pa. I get to love the design na eh..
Nice bag! When I became a mom I tend to bring a lot of stuff so I'm also using a big bag. We almost have the same stuff, I also bring umbrella, wallet, phone, wipes, tissue, candies and kikay kit. Women will always have the kikay kit in their bags. My bag used to contain the basic needs for my work like laptop and notebook/planner but I also include headsets and chargers. Mine is on the other bag. This is just what I have the day when I shoot it. The moment I had Nate, my life completely changed! Dati kayang kaya kong umalis ng super liit na (minsan walang dalang) bag! Now, even if we just have to go out of town for a day, I needed a BACK PACK! Yes, a bagckpack! And mind you, there's no place for make up anymore! haha! Guess I have to invest in a backpack too. I'm actually thinking of getting one soon eh. After the wedding. Para sana sa travel travel.. I can hear the same reaction to moms. I have plenty of big bags so I think I'm ready haha. The curly tops immediately got my attention. It's nice that aside from the basics, you always have food in your bag. I always need food to recharge. Students nowadays are too hyper! I need to adjust well to them. I guess you really love chocolate since you have curly tops on your bag. hehe. In my case I always bring my headset everywhere. My headset was hidden on the cosmetics pouch. I still haven't bought a purse to hide it in. I love chocolates and I only have it when I feel the need to. I love your Lacoste Bag! like you, I also carry big bag to fit all my essentials. Since, I have two kiddies I always, always have snacks and water with me and of course my gadgets. True! I can't leave the house without some of the gadgets. Feels like it's a necessity. Saw that pretty bag again. Well, I love big bags too. Sa dami ng dala ko hindi kasya sa isa lang. I always carry crochet yarn and hooks kasi hehe. Super complete ang laman ng bag including tea and chocolates! 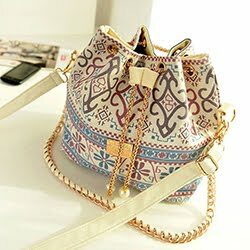 The bag is super cute! As a fellow teacher I understand the need to always have water in my bag - my mouth gets so dry from talking too much! We actually have the same things in our bag though I carry bigger sizes cause of my 3 kids. :D I love your bag by the way it looks so cute! We put the same essentials in a bag, but the difference is, my bag is not a Lacoste. hahaha! It's just some cheapo bag. By the way, I totally agree that your bag is really cute and dainty. It's just like your blog. Cheers! You are 100% correct that women should have a bag that is big enough to carry our essentials. I'm drooling over your Lacoste bag, they really offer great colors and classic bags! I'm beginning to collect Lacoste sis. It's really sturdy plus the design was just classic. Nope. Lacoste bags are very light and convenient for me. I love the style of your bag! It looks so kikay! i have different kind of bags for different purposes. But I can't go out without my wallet and sunblock hahahaa :) thanks for sharing! Wallet is a must! I only sometimes brings my sunblock which I know I should bring it everyday! Contrary to my belief that most teacher's bag contain pens, papers and other school supplies, it's cute to know its not how I have always imagined it to be. Hehe. Your Lacote bag looks really cute!!! I don't always bring my school stuff home. Only when I need to beat a deadline. 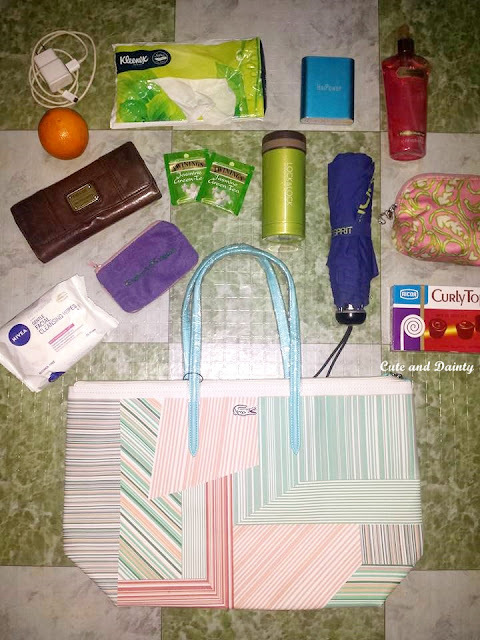 This looks a lot like my bag too, better to have everything because you never know when you will need something! True! I got a lot of things and I'm confident that I'm always covered.